Rinnai’s tankless water heaters are designed for efficiency with technology that features compact copper heat exchangers to provide maximum efficiency and easily meets ENERGY STAR qualifications and uses up to 40% less energy than a traditional tank. This product also has a longer lifespan, of about 20 years or more, compared to a conventional storage tank water heater and has recyclable parts, meaning less waste in landfills, and produces less CO2 and NOx than conventional tank water heaters. These tankless water heaters are able to save energy by operating only at times when hot water is needed rather than having a storage tank to heat and reheat water. This helps to save on energy and your utility bills. There is no use of an electronic ignition device with a standing pilot light that is continuously using energy. The tankless technology achieves maximum energy efficiency and helps to conserve natural resources. Rinnai tankless water heaters also come in multiple sizes to customize your efficiency and can be installed on any wall or even in compact spaces, including non-traditional spaces including crawl spaces, basements and attics. You can use these in any size of home including in mobile or manufactured homes. Rinnai tankless water heaters come in small sizes, at 18.5″ x26″ x 10″ or smaller. If you have a larger home and have a higher demand, Rinnai supports a feature, EZConnect, that allows you to link two units with a simple cord. For even larger applications, your installer can place multiple units in parallel. How does a Rinnai Tankless Water Heater Work? When turning on the hot water tap, cold water enters through the water heater from the inlet pipe at the bottom of the unit. The PC board is then signaled to activate the flame igniter or ignition. A combustion fan is turned on to allow oxygen into the burner to ignite the flame as the gas control valve opens at a low frequency. Once an adequate flame is present, the igniter stops sparking and begins the next sequence of operation all in a matter of seconds. Water is heated as it passes through the coils of the pipes of the home to the water fixture where the hot water is needed at that time. For condensing models, the water is preheated as it passes through a secondary stainless steel heat exchanger, capturing any extra heat before it escapes into the vent system. The gas valve and the blower automatically adjust the incoming gas and oxygen to meet the water heating demands and adjusts as needed to ensure the temperature set point is maintained. The water heater can use a smaller flame and less gas if the demand for hot water is small. If the demand is greater, the flame is able to expand across the width of the entire burner to heat more hot water. The user can choose their desired temperature with the digital controller for ultimate comfort and safety. When the hot water tap is turned off, cold water then stops entering the water heater and the flame diminishes. The combustion fan continues to operate at a low speed for a short period of time which allows the exhaust of any leftover combustion gasses. 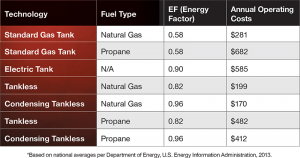 How will Rinnai’s Tankless Water Heaters be affected by the new DOE standards? 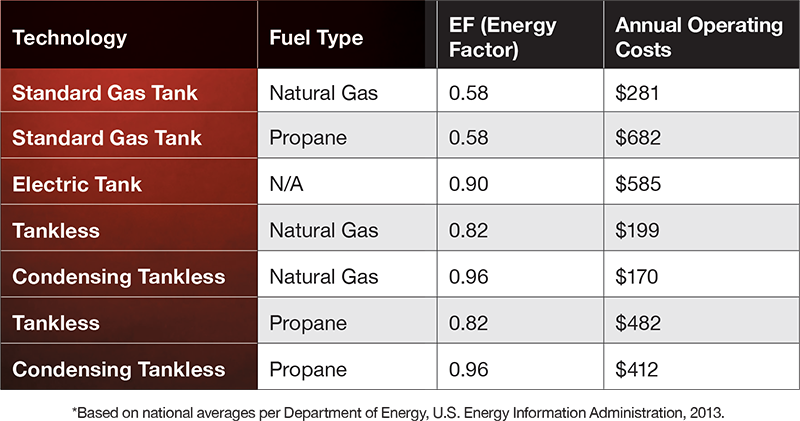 Rinnai’s Tankless Water Heaters are steps ahead in delivering the ultimate energy efficient performance and already meet the minimum DOE energy factor standards of .82, so the changes will have no direct impact. With the size and design of Rinnai’s products, tankless water heaters may be installed in a wider variety of locations, including places where the new, larger conventional storage water heaters will no long fit. For water heaters with storage tanks 30 to 50 gallons in size, the increase in the minimum standards will trigger an increase in the insulation needed, resulting in a larger tank diameter. In some cases, 2 inches or more, which will make equipment replacement more problematic because the same size of tank may not fit in the same location. Tanks above 55 gallons will now need to be high efficiency condensing units requiring an electrical outlet to power the unit, different venting, and also a means to drain the condensation. These changes add up to an increased overall cost of storage tank water heaters, including an increase in manufacturing cost coupled with potentially higher installation costs.